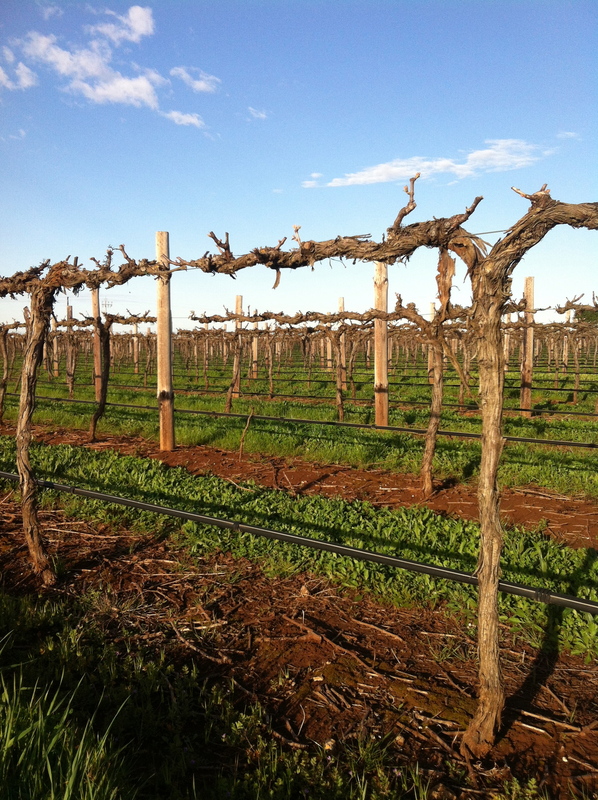 I didn’t expect or intend to enjoy the Coonawarra Wine Region in South Australia. My friend Jacqui and I agreed to meet there, as a convenient half way point between her home in Adelaide and mine in central Vic, for a weekend catch up. We both like a glass of white wine or too, so it seemed an obvious choice. After we made the plan I discovered that the region promotes itself as the “other red centre” of Australia – ie red wine. So I wondered how much it would have to interest us both, given neither of us drink red wine if we can help it! Then when I talked to colleagues and winemakers in my own region about my planned trip, and my intention to keep an eye out for ideas and inspiration worth exploring in terms of better promoting our own Pyrenees Wine Region, all I heard was “there’s no point, they have a name already, and lots of big players and we just can’t compete”. It actually made me determined not to enjoy my visit, in a bizarre kind of way. Maybe I didn’t want to believe I was on a hiding to nothing. Always a big fan of ignorance! I knew already that it was similar geographically to my home “local”, the Swan Valley region in Western Australia. The flat unvaried landscape full of wall to wall vineyards there, particularly along the Great Eastern Highway, has always struck me as boring and industrial. And so I expected similar of the fabled Coonawarra. By contrast the Pyrenees, which I have come to love so much, is a place of breath-taking views, unexpected valleys and hidden gems of vineyards sculpting the sides of impossible hills – just so stunning. My initial impression of the Coonawarra didn’t ‘disappoint’ – in regards the boringness. Entering onto the main drag immediately north of the core stretch, I progressed south towards our accommodation booking in Penola on an almost perfectly straight road lined both sides with endless vineyards and a profusion of brown tourism signs pointing to cellar doors. Pretty uninspiring. The most arresting sights of that initial introductory drive were a huge industrial-looking winery carved into the ground just to the east as I approached the main drag, and a large block of recently ripped out vines awaiting clearance part way along the main road. It was, frankly, quite depressing. On arriving in Penola though, I could feel my resolve slipping. Always a sucker for a town that values its built heritage, I first noticed the visitor information centre was in a spectacularly impressive heritage building. 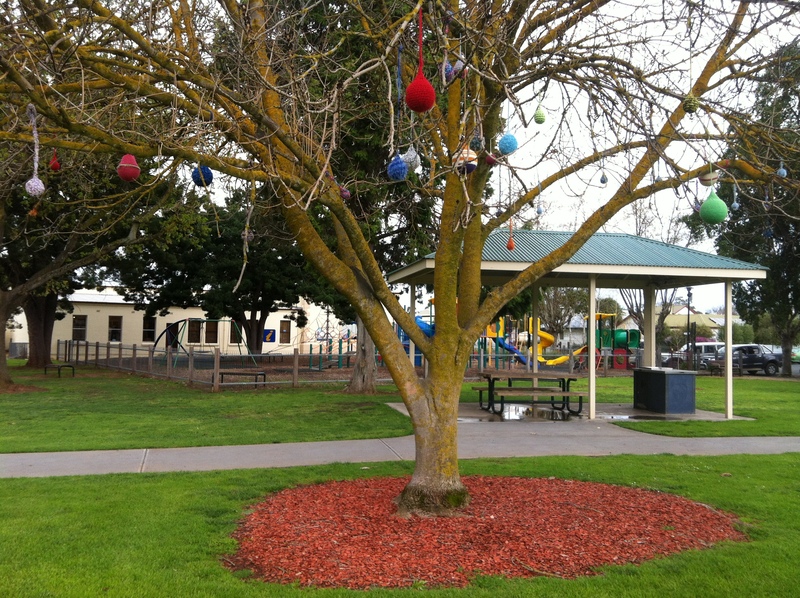 This was next to a gorgeous well maintained town centre park with fab kids playground, bbq’s and adjacent outdoor swimming pool and intriguing yarn-bombed tree. A small detour around the back streets in order to find the backpackers where we’d booked in gave me glimpses of more historic precincts and enticing shops and restaurants. 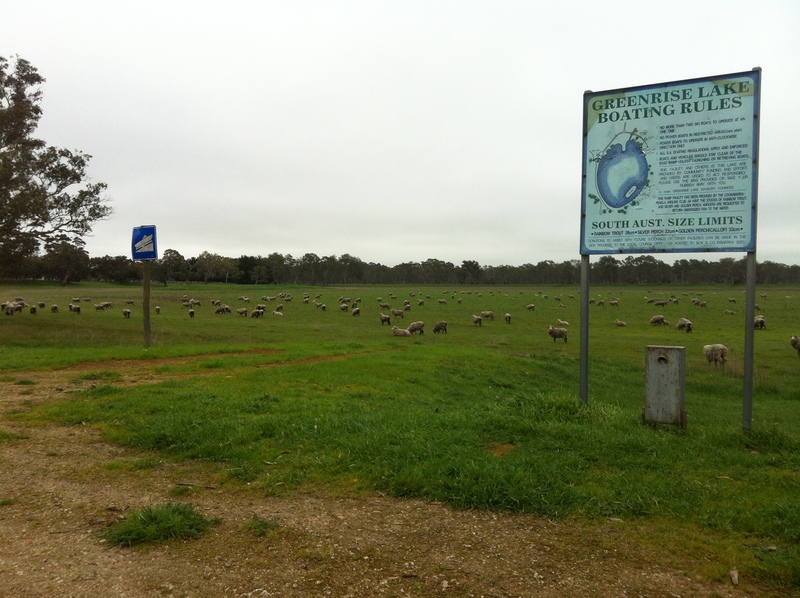 After settling in to the very comfortable Penola Backpackers, Jacqui and went for a walk to explore our weekend “home”. Petticoat Lane – full of National Trust and heritage listed buildings – was fascinating and includes a cute little cottage you can stay in. On the corner of the Lane, the impressive centre celebrating the life of Australia’s first Saint Mary Mackillop (who had links in that area I understand) looked interesting. We checked out the menu at the award winning restaurant in town and considered whether we might make a booking for the following night. The main street had all the elements needed for vibrancy, though it was actually pretty quiet at the time – apparently not so unusual for that time of day but today it was partly due to the town preparing for the big footy and netball grand finals the next day. Understood! Important business that. The town centre was tidy, clean and had an attractive mix of shops and businesses, with no empty shop fronts and a smattering of artistic chaos in the form of more yarn bombing – including a cheeky beard on the statue of the town’s founder. 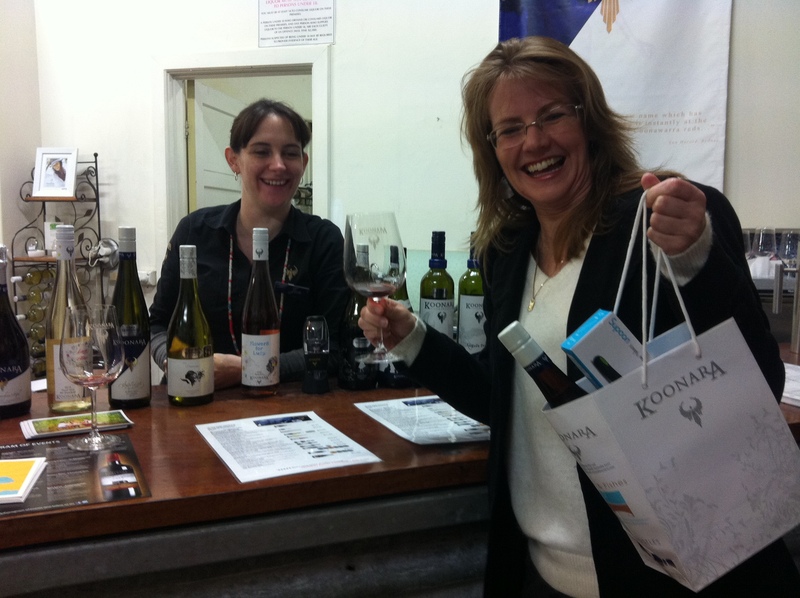 Then we stumbled upon the Koonara cellar door and gift shop in the town centre, and dived into our first tasting under the guidance of the fabulous cellar door manager there who was welcoming, entertaining, educational and provided a faithful introduction to what the weekend would hold in store for us. She even gave us detailed advice on the best cellar doors to visit for exploring the best white and sparkling wines the region had to offer, (other than theirs!) which we thought quite extraordinary. So much for the Coonawarra being all about red wine! The owner of the winery called in while we were there and we also had a very interesting chat with him, quite an inspiring character. The next morning I was determined to keep up my training for the big trail run in November, so headed off first thing. The woman I’d spoken with at the visitor centre the day before had recommended I head to Greenrise Lake for a good off-road run. While not great preparation for a forest run, it was appropriately rural at least and very entertaining staring out the odd sheep in the reserve that wasn’t scared off as I approached (which made me think uncomfortably of the absurdist Haruki Murakami novel Wild Sheep Chase) and I had a good laugh when I saw this sign. Okay, I know that actually it’s not that funny given it’s a sign of drought, but the absurdity of it still appealed to me. I blame that on my high school literature / drama teacher Mr Stone who didn’t believing in teaching Shakespeare and instead taught us about absurdist or hyper-realist drama like Stoppard, Pinter and Beckett! Well, that’s my excuse for weirdness, and I’m sticking to it. As the rest of the day progressed, the 22km stretch of endless vineyards and cellar doors grew on me, to the extent that by the end of it Jacqui and I had decided to return for the region’s big race meet in January. I came to notice the various stages in evidence along the drag of vineyards at all stages of life – the recently ripped out blocks I mentioned earlier, the newly ploughed ones ready to plant, the early spindly vines just reaching up towards the frame through to the well established, solid gnarly vines with shoots just starting to show. Yes the landscape hadn’t changed and it was still flat and boring, but the concentration of life and evidence of the life cycle surrounding you every which way you look was impressive in a different kind of way to my new back yard. In terms of the experience of the cellar doors – what I did notice once you got past the façade that some of the cellar door staff had (Jacqui is particularly good at opening up conversations, and we chose a smaller number of cellar doors and stayed longer at each than many might) was how willing they were to open up and tell you about the region, about the other wineries they’d worked at, the other wines from different places they thought we should try and how they all enjoyed their monthly get togethers with other cellar door staff to get better acquainted with other producers offerings and to foster cooperative relationships. Surely that’s something from which any wine region can take some positive inspiration? It sure made for an enjoyable overall experience, and a great impression of cooperative working, which to me is always appealing. 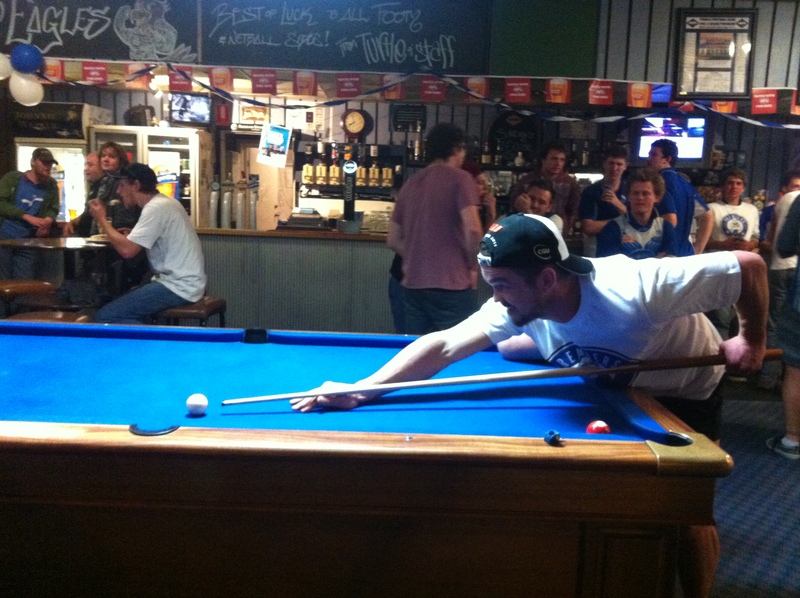 On our last night in town, we were entertained at the local pub by some of the local footy team guys, who had been victorious the day before in winning their league grand final and were still celebrating. In a brief instant when I disappeared back to our accommodation, Jacqui was roped into a game of pool by one of them, and between them they held the table for well over two hours. I was kind of relieved actually, as I knew she wanted a game and was a bit of a shark – and I also knew I was way too useless to challenge her or to not make a fool of myself in front of any audience. So all’s well that ends well! PS. It’s also hard to not like a region that has a vineyard called The Old Cricket Ground! More to come on that theme. This entry was posted in Uncategorized and tagged Coonawarra wine region, Koonara, Penola, Penola Backpackers, South Australia. Bookmark the permalink.